Sustrans and Friends of the Earth believe that the government are failing to take value-for-money steps proven to cut traffic and carbon emissions, despite the advice of the Government's own expert advisor. Their research shows that only a faction of £6 billion allocated to councils for Local Transport Plans is being spent on sustainable travel. This is despite specific recommendations by the Committee on Climate Change for a phased roll-out in towns and cities across the UK of Smarter Travel Choices (STCs) – schemes that promote greener travel, including walking and cycling, public transport and car sharing. The research looked at 16 transport plans and found that an average of just 70p per head per year is being spent on STCs despite recent pilot studies in three areas showing that encouraging sustainable travel can be very cost effective. Solar panels are to be installed at Derbyshire County Council's properties, including schools, at a cost of £500,000. The investment will be paid back through the Government's Feed In Tariff incentive. The plan was reported in this article in the Derby Telegraph http://www.thisisderbyshire.co.uk/Solar-panels-plan-set-ahead/story-12921409-detail/story.html and has since been approved. 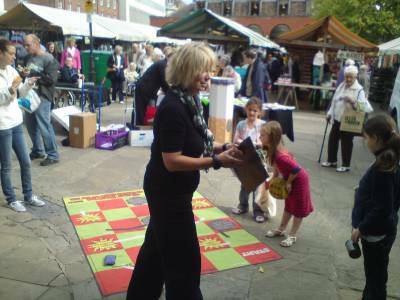 Chesterfield Market hosted a Green Fair on Saturday 24th September. The Fantastic Home trailer joined a number of solar panel installer and the local council’s waste and recycling team to offer people advice on all things green! It was buy from the word go and we were able to assist with all manner of enquiries from complex solid wall heating issues to tariff switching. There were a lot of people who were not yet on water meters who could stand to save significant amounts by switching. With the large number of solar installers present around the market, staff on the Fantastic Home stall were able to offer a valuable honest broker service talking people through their various options. All events: FREE, Places are limited and pre-booking is essential by contacting: kirsty.mitchell@cse.org.uk. This is a fantastic opportunity to learn more about community-owned renewables. This very practical event will equip you to tackle everything involved in setting up a community-owned renewable – from choosing an appropriate technology and getting your community onboard to finding funding and applying for planning permission. In addition, each event will have a keynote speaker from a local project – includingTutbury Eco Power at Nottinghamshire, Torrs Hydro in Derbyshire and North Kilworth’s solar photovoltiaic project in Corby and Leicestershire. The former is the first full operational community-owned hydro project in Derbyshire. The latter recently secured £60,000 of lottery funding for solar panels on a number of community buildings. All community groups represented will receive a comprehensive handout pack, including DVDs, activities and exercises to take back to your local community. Get a sneak preview here: www.planlocal.org.uk. The event will make use of the Plan Local Model, a 4m x 1m model of a typical town with various renewable developments. 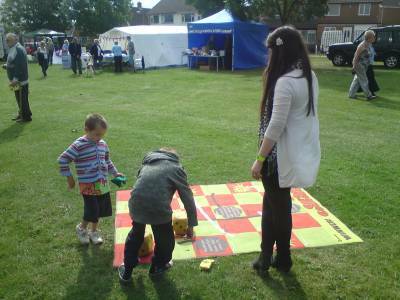 The Fantastic Home recently visited Stapleford Carnival for the second time in three years. In addition to MEA staff and representatives of Broxtowe Council we were joined by our new local volunteer Paula. The energy bike was in almost constant use by young and old throughout the day, and, as the photo shows, people got stuck into the carbon countdown game too. Lots of people enquired about solar photovoltaics and we were able to promote Broxtowe’s own solar scheme. We even had a few enquiries from those that already had some solar panels but wanted more. There were a number of commercial installation enquiries and we were able to refer people to local, reputable installers.